As the WebOS community has shown, hacking around the inner coding can result in some very nice results. Such is the case with the amazing Virtual-Keyboard and various smaller patches like downloading in browser and smaller launcher icons. Patches help personalize a device to our liking. However sometimes modifying files can go wrong and you find yourself left with a buggy, incomplete, or non-responsive device. Thankfully, Palm has thought ahead and provided WebOSDoctor. With WebOSDoctor at your side, there's essentially no such thing as bricking your device. One big downside, unfortunately, is that WebOSDoctor completely wipes the data from your Pre. 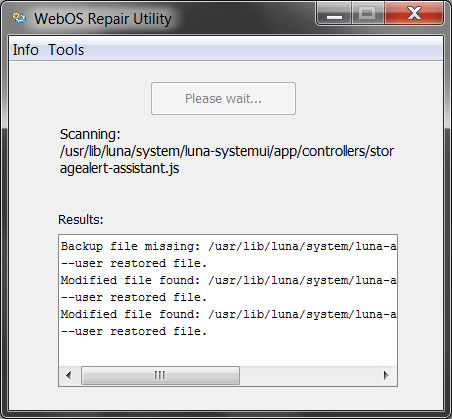 So today, I am happy to present my latest creation, a completely unofficial WebOS Repair Utility. Essentially this program helps by scanning a device and comparing the files found to what they're supposed to be, pointing out what files are different from the factory originals and giving the ability to restore modified or missing files directly from the the WebOSDoctor. This is a huge leap forward in simplicity, considering the numerous steps that were required in the previous way of restoring individual files from the WebOSDoctor. And yes, it is still a fresh release and there's bound to be some bugs, but this is a welcomed solution for times when hacking goes awry. To learn more, check out the WebOS Repair Utility thread in our forums!